Since 1997, thousands of websites have chosen UBB for their forum software solution. 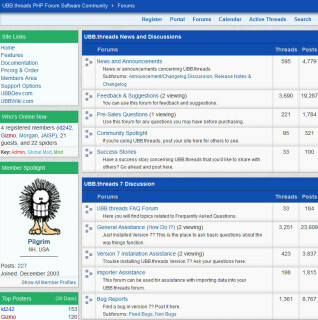 Whether you need a forum to integrate with your website or you want your forum to be your website, UBB is your answer. No matter if you have a small, medium or large site, our software can scale to your needs. With the integrated Portal and Photo Gallery (UBB.Gallery) you can create your entire website using UBB without the need to buy anything else, and without the need to try and integrate various products for a seamless user experience.